Save SAR 315 (70.16%) – Earn 13 Shukrans What is Shukran? Shukran is the Landmark Group’s award-winning loyalty programme in the Middle East, which allows you to earn Shukrans when you shop any of our brands. 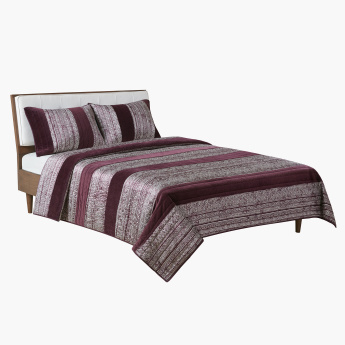 Upgrade the style of your bedroom decor with this printed bedspread set. The bedspread and two pillow covers are crafted from a high-quality and breathable fabric to ensure that you get a good night's rest. This set, which is easy to wash, is ideal for a super king-sized bed.